UPDATED: If Measure A (Azusa Rock Quarry referendum) is turned down, could Azusa just renegotiate a new agreement? The Tribune had an editorial meeting with members of the Canyon City Alliance and Azusa council members Robert Gonzales and Uriel Macias today. After listening to their pitch, an interesting comment came about during discussions about Measure A and the Azusa Rock Quarry mining project. 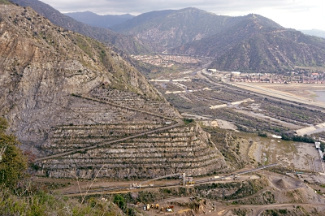 It is and has been the position of the majority of the City Council, Azusa, and the CCA that a no vote on Measure A would only nullify Vulcan Materials Co.’s amended mining plan’s development agreement, but that its use permit would stand. Essentially, the mining would be allowed to continue but many of the benefits negotiated by the city with Vulcan Materials would be lost (a fact that remains questionable). Now, of course that all comes with the caveat that legal challenges – and you can be sure there would be one – could argue the CUP and development agreement are tied together and upon success in a legal challenge, they both could go down. But barring that hypothetical, the question was posed what would stop Azusa from negotiating a new development agreement connected to the project if this one is rejected? The answer, in short, was nothing, according to Macias. The long answer was no one knows what will happen during a no vote. Litigation? New deal? It is all something of an unknown, Macias said. But to me, that said that, barring a legal victory to the contrary, a no vote on Measure A could lead to the city renegotiating new benefits with Vulcan. Whether or not Vulcan will listen, is certainly a question. And the company would then be put in the position of having a significant amount of leverage. UPDATE: Azusa Councilman Keith Hanks phoned me and reminded me that there is a one year “cooling off” period following a referendum of a council action. So if a new deal were to be struck, it would have to be done in 2012. On a related note, I asked Canyon City Alliance officials if they would be donating to candidates in the City Council election. President Liz Ramirez said those discussions have not taken place with board members. Chamber of Commerce board member Mercedes Castro said that after Jan. 26 (the referendum special election is Jan. 25) the group intends to disband. UPDATE: (I really hope this is the last one, I have received more phone calls on this post than any other.) Castro called me and told me she misspoke when saying the CCA would disband following the referendum election. The group will still exist, but may close its offices, she said. Macias then jumped in and said he would not accept any money from Canyon City Alliance. It is well known that Vulcan is a member of the CCA, contributes services and is the major source of funding for the group. I got a press release from Elizabeth Ramirez yesterday announcing that Canyon City Alliance had hired a one Elizabeth Ramirez. Weird, same name! I wonder if the other Elizabeth Ramirez even knows that! OK, OK. I know they are the same person. Mostly because Elizabeth Ramirez said they were. Anyhoo, since I haven’t really talked about them yet, the Canyon City Alliance is a group of businesses, police, and community members who support the newly approved Azusa Rock Quarry mining plan. Ramirez will be the executive director of the group that also boasts Azusa Chamber of Commerce executive board member Mercedes Castro as president. the Alliance’s support for the City’s recent approval of the Azusa Rock project. downtown, as well as the recently approved requirement to restore Azusa’s hillsides. “I am excited to be joining a group of such dedicated residents and community leaders.